The Defender goal is to keep the Invader from breaching the Stronghold for 7 Turns. The Defender has the following Units available: Marksman - Strength 1, Soldier - Strength 2, Veteran - Strength 3. Remember: At the start of every Turn the Defender receives 2 Hourglasses to use after the first Invader Action. The Actions of the Invader take time and as such they provide the Defender with a certain number of Hourglasses. Each of the Defender Actions also takes time and has a certain cost in Hourglasses. The Defender uses these Hourglasses to move his Units around the Stronghold and perform defensive Actions. After each Invader Action, the Defender must spend all Hourglasses in his supply. Place the spent Hourglasses in the spaces next to the Action. Placing the Hourglass on the last free space activates the Action. When all the Hourglasses are spent, the Invader takes his next Action. If the Defender receives no Hourglasses, the Invader starts the next Action immediately. from a Building or the Courtyard to any spot on the board Only Marksmen may move into the Towers. The Defender cannot move Units to the Forge, the Workshop, the Scouts, the Hospital or the Cathedral. Note: Game components may override these restrictions. The Heroes may only move on Wall sections and to/from the Courtyard. Note: The Defender may move any number of Units each turn. Individual Units may move multiple times. Discard the Hourglasses used to pay for Movement actions. Cost: 1 Hourglass per swap Effect: Instead of moving to a free space, a Unit may swap places with another Unit in an adjacent space. Heroes may also swap in this manner. Note: The Defender may move any number of Units each turn. Discard the Hourglasses used to pay for Movement actions. The Courtyard may hold an unlimited number of Units. At any time during the game, the Defender may choose to use the Defense Plans chosen at the start of the game. Once used, all Defense Plans have a negative section that affects the Defender in different ways. Most Defense Plans are retained for the remainder of the game and continue to impact the Defender. The Defender spends Hourglasses to perform Actions available in the Buildings. The Defender does not need to have all the Hourglasses necessary to complete a specific Action at one time - they may be built up over a series of Defender Phases or Turns. 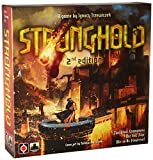 Each Action available in the Stronghold may only be performed once per turn unless otherwise noted. After the turn is over, remove all Hourglasses used on completed Actions. Hourglasses placed on Actions that were not fulfilled remain for later Turns. If there is a Saboteur token in a Building, it increases the cost of the actions in that building by 1 Hourglass. The additional Hourglass should be placed on the red Hourglass space on the Building tile. There is a brief summary of each action available below. For a more detailed explanation of each action, see the Defender Actions Explained on the extra sheet. In the Forge, the Defender fashions the armaments required to defend the Stronghold. Location: Tower Effect: During Ranged Combat, choose this side's Foreground, or any Rampart opposite or adjacent to the Tower. Reveal the top card of the Defender Hit deck. Kill one of the indicated Units. If more cannons shoot, resolve all cards and then reshuffle the deck. Note: Each Tower may only have 1 Cannon, Pole, or Bay Window. Location: Wall section Effect: During Melee Combat, kill one unit of the corresponding type. Goblin Cauldron kills all Goblins. In the Workshop, the Defender's craftsmen build the wooden fortifications and tools of defense that are needed in the Towers. Location: Tower Effect: During Melee combat, choose 1 Wall section adjacent to this Tower. Reveal the top card of the Defender Hit deck for each Pole. Kill the weakest of the indicated Invader Units on the Wall section. If more poles attack, resolve all cards and then reshuffle the deck. Location: Tower Effect: Gain 1 Strength at both Wall sections adjacent to this Tower during Melee combat if there is at least one Marksman present. Location: Wall section Effect: You may have an extra Defender Unit at this Wall section. Location: Wall section Effect: Place 1 Wall component on any Wall section. Training the scouts is key to protecting the Stronghold. Use your advanced units to sabotage the Invaders best laid plans. Location: Path (placed face down) Effect: When the Invader moves over a trap reveal it. Troll - Kill 1 troll, Goblin - Kill all goblins, Siege Tower - The Siege Tower does not move during this maneuver (it may move in subsequent maneuvers). Effect: This weapon may not fire during the next Assault. Effect: Place the Spy token on an available Invader Action Card. The Invader must pay +1 Unit when activating this card. Note: The Spy may not be placed on the Phase 1 or 6 cards. The spiring towers of the cathedral are not only good for worship and prayer. Looming high above the walls, they make a perfect location for marksmen and lookouts. 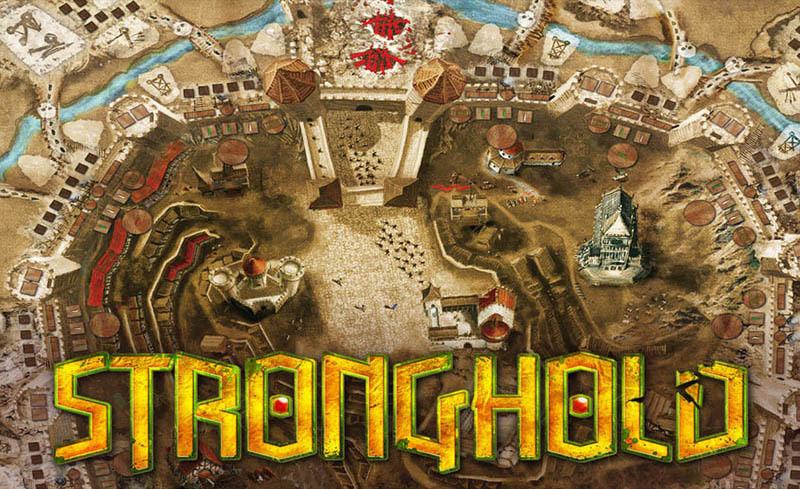 Location: One side of the Stronghold Effect: During Ranged Combat, Marksmen on this side of the Stronghold fire all together at any single Rampart on this side of the Stronghold. Location: Wall section Effect: The Assault is not resolved at this Wall section. Location: None Effect: Kill one Invader Unit anywhere on the board. Location: None Effect: Discard one Invader Order. While stuck inside the Stronghold's walls, the defending units have plenty of time to train for the inevitable battle. Note: Training Actions may be used multiple times during a turn. Remove spent Hourglasses after each use. Effect: Replace a Unit in the Barracks: Replace 1 Marksman with 1 Soldier, Replace 1 Soldier with 1 Veteran. The Guards allows the Defender to remove Invader Saboteurs from the Stronghold. Effect: Discard 1 Marksman from the Guards to remove all Saboteur tokens from the Stronghold. All Defender Units which die this Turn are placed in the Hospital. At the end of each Turn two of these Units (Defender's choice) recover and are moved to the Courtyard. The rest of the Units at the Hospital go back to Supply. The Courtyard can hold any number of units and Heroes. There are no special actions on the Courtyard, it is simply a holding place for unassigned Units. Two Heroes assist in defense of the Stronghold: the Officer and the Warrior. Each of them affects their Wall sections differently. Additionally, each may perform one Heroic Order per Turn to aid the defense. These Orders do not cost Hourglasses and may be used during any Defender phase. The Heroes cannot be killed. Action: Each Hero may perform one Heroic Order per turn from the following options. Each Heroic Order may only be used once per turn. Move 1 Unit from the Courtyard to a Wall section where a Hero is present. Move any Unit to any Building (except for the Guards and the Barracks) and gain 1 Hourglass to use on the chosen Building. Move one unit from any Wall section, on the same side of the Stronghold as the Hero, to the Courtyard.